Your Cooking All Year Round! Growing sage yourself is an excellent way of ensuring you have a continual supply of the freshest tastiest leaves at all times. There are a few ways of cultivating this popular, pretty herb; from seeds, cuttings, layering and root division. And with an estimated nearly 750+ varieties available, you're sure to find some you like. Do note, whilst there are many edible varieties of sage plant: common, pineapple, purple and narrow leaved, for example, there are also inedible types. Others like the Mexican bush variety is for decorative and ornamental uses only. So when buying decide what you want to use them for. Read more about the plants. In late spring or early summer, take a cutting of 3-4 inches (10-12cm) from a new growth. Insert into a pot in using a standard potting compost, water and leave in a warm place. Once roots have set (about 3-4 weeks), plant outside in a sunny spot 18-24 inches apart. Placed in full sun, this herb is ideal for pots or containers. Cuttings or young herbs from a nursery or garden centre are best. Use a standard potting compost and feed only after flowering, don't overwater. Like most herbs, it doesn't really suffer from pests or diseases. It may suffer from rot if planted in a damp spot, so make sure it's in a dry spot in full sun. Early Spring: Sow seeds indoors. Spring: Cut back older plants to encourage new growth. Sow seeds outside. Late spring: Take cuttings. Summer: Cut back once they've flowered. You can now give a feed. Autumn: If you have an older, established plant you can layer some of the mature but not too woody branches. Winter: Add mulch, straw or protective fleece to the younger plants. It doesn't like metal, so only pick the leaves with your hands. When preparing to cook with it, tear the leaves rather than using a knife. Like a lot of herbs, it can get a bit woody and start to lose its flavour after 3-4 years, this is the time to start anew. 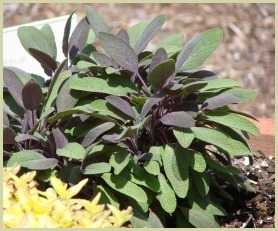 After you've harvested the leaves, why not try my super healthy sage tea recipe?